At CWA, we are honored to help clients reach their financial goals and witness their growth and success. Recently, some of the CWA team attended the 13th annual Birdies, Bogeys and Bones Golf Tournament and we gleamed with pride and appreciation for our clients Doug and Laurel Renegar and Mike and Tamara Lister and their team’s dedication to give back. 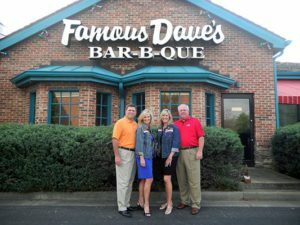 These two couples have been CWA clients since 2002 and own/operate Famous Five Dining (FFD) which owns five Famous Dave’s Legendary Pit Bar-B-Que restaurants in Central & East Tennessee. In a short 13 years, Famous Five Dining has raised over $500,000 benefiting Make-A-Wish of Middle and East Tennessee. Laurel and Tamara were best friends in high school. Doug and Mike were fraternity brothers who worked their way through college serving tables in the same restaurant. Mike and Tamara starting dating the night Doug and Laurel got married. Twenty years later, they pooled their resources, moved their families to Nashville and formed Famous Five Dining. The Renegars and the Listers, along with their leadership teams, really believe in giving back to their communities and in particular, to blessing children and their families whenever they can. While they support a number of schools and organizations that focus on children, their passion for Make a Wish stems from being parents and recognizing how blessed they all are to have raised healthy kids. 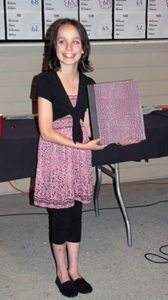 It began in 2002 as a small golf outing for a few vendors and friends of Famous Five Dining. 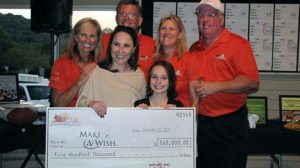 But the tournament raised enough money to fund two wishes for Tennessee children with life-threatening medical conditions, and the company owners and operators were hooked. In 2015, over 150 golfers participated in the tournament and raised over $70,000. Every September, the tournament brings together so many of their vendor partners and friends! They gather annually to laugh, to eat together, to golf and to raise funds to bless others. Every year, they admit that they are more humbled than before that their time spent together blesses others too. The highlight of the event day is the chance to hear from a Make-A-Wish Ambassador, a wish recipient who can tell their story and explain why the tournament matters. In 2015, 13-year-old Jessica Meyer shared her journey through brain cancer and the impact on her life when she was offered a “girl trip” to Walt Disney World for her mom and her closest friends through Make-A-Wish! Though not in remission, Jessica has decided to remain positive and to help provide other sick children the opportunity to have a wish granted! The accolades don’t stop with their golf event. Famous Five Dining has six times been awarded the Famous Dave’s Corporate’s Enduring Flame Award, which celebrates their commitment to culture and employee development. The company has also received Famous Dave’s first Community Service Award in 2007 and was again named for that honor in 2008 & 2009. In 2010, 2011 and 2012, they earned the Famous Neighbor Award for FFD’s contribution to and support of the Make-A-Wish Foundation and other organizations that make their communities stronger. The team at Famous Five Dining all work and live by five values that are as real as their name: Faith, Family, Friends and Famous Food. (To their way of thinking, “Famous” is a value unto itself!) They challenge their associates to proclaim these five values by name, own them and live them well. They operate business by what they call the “FD Rule”: Treat others BETTER than they expect to be treated. Our CWA team is so proud of Famous Five Dining’s business success and endless work in the community. They are Famous role models to us and to their communities!